The network Affiliate Window recently launched a great system called ‘Shop Window’ where you can take code written by them that imports all of the available merchant feeds direct to your website. It means you can create your own Affiliate site in minutes, and with a little website design flair and CSS knowledge you can customise the website to your heart’s content. 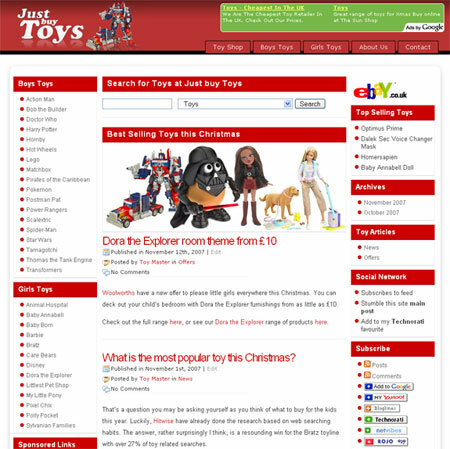 With this in mind we’ve just launched the website www.JustbuyToys.co.uk through Just Search. 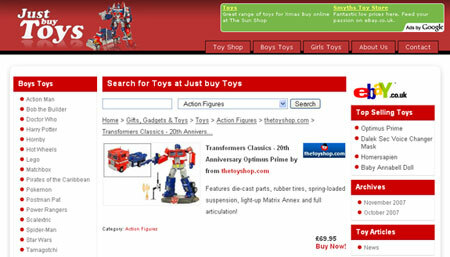 It contains product feeds from many of the major merchants in the toy industry such as Toys R Us, The Entertainer and Woolworths and features category pages for toys like Barbie, Bratz and my personal obsession; Transformers. Have a look at the site, browse around and buy some toys! Seriously, you don’t need to buy any toys if you don’t want to, but the website is a shining example of how Affiliate Window’s ‘Shop Window’ can be used and customised. Naturally we’ll be making a few of these now in different sectors and promoting them using natural SEO. I’m so excited I could rip a tissue. If you want to create your own affiliate site like Just buy Toys then you can sign up to Affiliate Window and get designing. Looks very nice. What made you picked toys though? such a low commission rate. Thanks, I picked toys because I know a lot about them and can promote them with content as opposed to PPC. We are launching other sites in different sectors too, more on them to follow. Some of the commission rates aren’t too bad mind, TheToyShop.com (the Entertainer) has a 10% commission rate.